Discussion in 'Characters' started by Diego Jurado Noboa, Apr 5, 2011. Let's talk about the Teenage Mutant Ninja Turtles! This is more or less the idea I had for these characters. As you can see... I don't have a clear idea on how I would suggest to implement a 4th Turtle, but I put some of my ideas in there anyway. (Sorry for the lack of original shuriken and boomerang sprites, they were nowhere to be found). Of course, the "extra" turtle doesnt' HAVE to be Mike, it could be any of the others. But I guess for story, Leo or Mikey could do in replacing Peach. Leo, for being the leader, or Mikey for goofing around so much that he was captured. Also, Leo and Mikey have pretty much the same range, hence why I suggest that if one of them should be left out, it should be one of those two. Or, Mikey could appear in the water levels. Since the turtles don't do anything in them (except deactivate bombs), it makes no difference what power up they're using. This is very interesting,but I think I can do it much better! Fire Flower : Can Use Shuriken and Boomerang,Shuriken goes further and is much powerful,Attacks also become a bit more powerful as well! Also if you press a button,you can switch between the Turtles,but if one dies,you can select another and start from before the player died,but if all Turtles die,have to start all over,also you can revive them all by gaining a 1UP. If you have not gained a 1UP in a level,then you can only select 1 turtle to choose from! Pretty much,I disagree with replacing Peach/Toad,cause all the players are going for the same exact goal,to beat Bowser and save Peach! Ok they can swim,but the skateboard might make the game much harder to play,cause it would go too fast I believe. It can be toned down but its not that good anyway. For music,well haven't listened to soundtrack and I am not gonna waste a bit just to find music! I see a lot of people trying some way to implement all the turtles into one character. I said this before, but this is making it too complicated. But that's my opinion. You only need one turtle. I said Leonardo since he is the one usually first thinks of when talking about TMNT. He is the leader after all. Plus his katana has the best range. Raphael is too short and remember the enemies react as they would in each characters game. For Raph to have to get up close all the time would ensure death as enemies never stop in their tracks when attacked. That's the game play from their game. Donatello isn't good either because you have to be accurate with his bo staff. And the goombas and most other enemies are so short that his staff would pass right over them. Only way to safely attack them would be attacking from the air(DTMF!). Unless they have unlimited ammo for their sub-weapons, which they shouldn't because again, another game mechanic, that kind of game play with Raph and Don will be very difficult. So this is why I feel Leonardo is best. 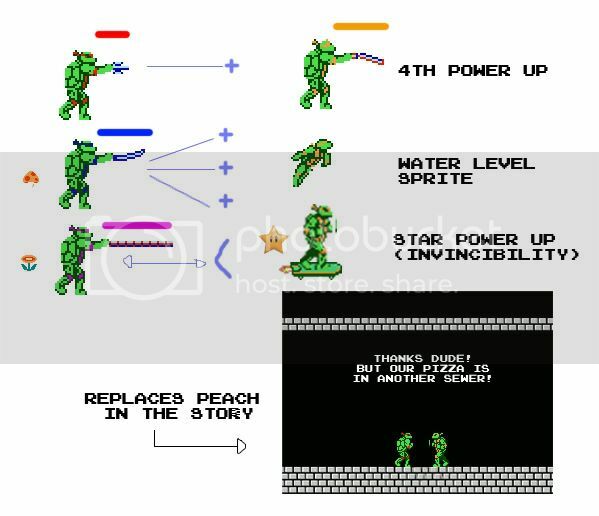 As far as weapons, I agree with the throwing star and then the triple star, but I feel the scroll would be a better Fire Flower ability as it would differentiate him a bit more from the other characters(Leo already has a sword like Ryu, and giving him a boomerang would make him similar to Link). When he gets power ups I suggest a different shade of green for the Mushroom, but perhaps make him look similar to Mecha-Turtle from the game for the Fire Flower. Just in case anyone was gonna correct me, Metalhead and Mecha-Turtle are 2 totally different characters albeit both robots, lol. So that's my take on the idea. What are your thoughts? Using one Turtle was also an idea I had, but what the heck, I preferred to go all the way and try to implement all turtles into the gameplay. Yeah, it sounds MOST plausible for a single turtle to be in the game, but IMO, what's so likeable about that particular TMNT game, is switching turtles around (which in this case, could be TMNT's "gimmick"). It's not more complicated than say... Samus. Mushroom Samus = Bigger ranger, power suit sprite. Fire Samus = Bigger range with zigzagging effect, recolored sprite. Maybe it's even a little less work than Samus. Oh, and if the pits are too big, he could always use the Turtle Rope at least once during the level. It's not like the character was made for jumping over huge pits. He was exclusive only to the first game for the NES. So I'm not surprised if the majority don't know or remember him. "So do you like to step on turtles?" "Come'here and try your luck, your damned mustached!" Alkerion and Mr.Giang like this. I've played this game, I tested there would be in super mario crossover. The gameplay alternates outside run for it and exploring buildings or sewers parallax scrolling. To confront the enemies of the game, the player can use the weapon of turtle that is selected (by default, the first turtle alive in order Leonardo, Raphael, Michelangelo and Donatello) or weapons recovered in levels as boomerangs, shurikens or when the turtle is driving their truck missiles. The second part of the level 2 goes under the water of the Hudson River, where the turtle swimming in a flooded pit filled with traps to defuse eight bombs. In case of death of a turtle, it loses all weapons before she could recover. It is possible to get lost in the first turtle at level 3, it has actually been captured. Do we have a TMNT thread already? I ran a search but nothing came up. I found it at the moment. Sorry alice, forgot to edit the post saying I was ninja'd. Faruga, Alkerion and uglyrodent like this.